Minneapolis – St. Paul Government Pensions Revealed! 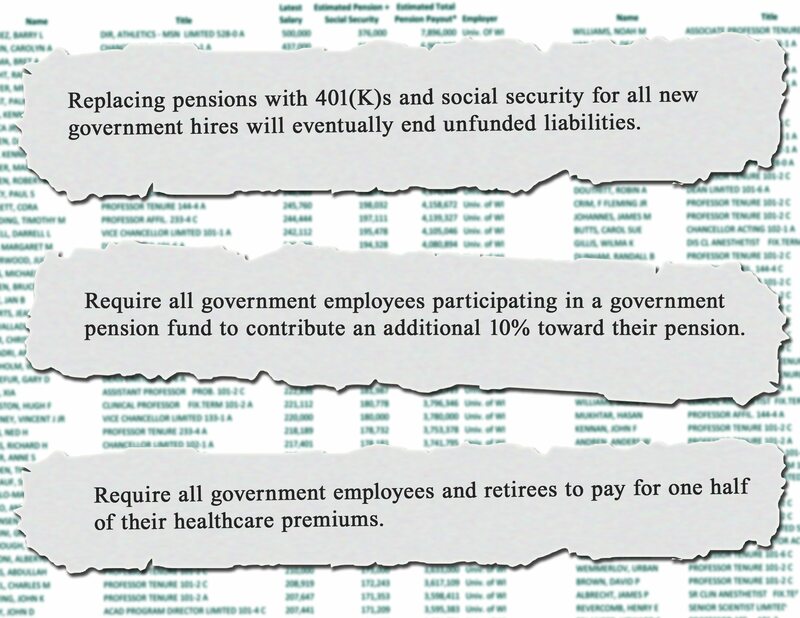 Home → Latest → Minneapolis – St. Paul Government Pensions Revealed! St. Paul—Taxpayers United of America (TUA) today revealed retired government employee pensions for the Cities of St. Paul and Minneapolis, statewide government employees, and Hennepin and St. Louis Counties. Many Minnesota government employees are becoming pension millionaires when retired. Thank you for explaining the issue to the American public. There was a very good article in the Saint Paul Pioneer Press April 23. I see the issue both ways in my own family. My father worked >30 years, and has a very generous PERA pension. Our daughter is a second grade teacher, working >40 hours per week, and earns 1/2 of my father’s pension. She cannot afford to purchase a house in the same neighborhood where my father lives (because either housing is too expensive or she does not earn enough). I love them both, but the future of our country depends on providing for the NEXT generation. Kasich, the Republicans in Columbus and the pro SB 5 crowd continue to spaerd the contemptuous lie that public employees have a free ride regarding their pensions and healthcare insurance costs. I feel that the anti SB 5 organizations should do more to address this blatant distortion as many in the general public believe it to be true. Kasich’s treatment of public workers is indicative of his opinion of the working class and the damage he will attempt to inflict on them during the rest of his term. In a never ending, ever accalereting pandering to BUY votes with the tax-payer’s dollar for the sole purpose of enriching themselves and feeding their own hunger for ego satisfying power a succession of morally bankrupt individuals have lead NJ to the fiscally unsustainable position we find ourselves in today.It is nothing short of astonishing that in the last CENTURY there has not been ONE Governor in NJ who has put the interests of the general population ahead of his/her own.Whether or not they actually get caught breaking the letter of the law they all have been as corrupt as any person who has ever lived. Watching out for the population at large IS NOT DIFFICULT. To have done it so poorly over such a long time speaks very poorly of the quality of not only the elected but those doing the electing as well.A society bereft of moral footings soon succumbs to the equivocating of those promising to scratch their lust and greed. The irresponsible political class pandering to the irresponsible yearnings of those that feel they are entitled to that which they have not earned can only lead to the position we find ourselves in today. When you have a bunch of PIGS feeding a bunch of PIGS the only thing you can expect to end up with is a PIG STY.Welcome to NJ, PIG STY of America. What is the password for the MN State Legislators pension guarantees? I really would like to know what working for less that 5 months a year gets you. Sickens me that this is so out of control and those who knowingly took advantage of system. Many quite well off are just ‘screwing’ the general public adn will continue to do so while the majority of us are still cutting back just to get by. Looks like it finally time to leave Minnesota for a state that cares more about it’s residents. We pay for sports stadiums (private industry), Subsidize the biggest mall in the country (again, private industry, and provide for the largest population of immigrants in the country who find every loophole in the book. Yup, time to move out of Minnesota before I get gouged again to pay for things I don’t support. We should not just blame the welfare people take advantage our money. It everybody took advantage. should not just blame one group people. We are DOOMED!! I am sure the 99%er’s are NOT going to keep on paying these pensions.